The design of the 359-bed hospital, by Conrad Gargett Lyons, won the prestigious Future Health Project Award at the 2014 Design and Health International Academy Awards (Photo Credit Christopher Frederick Jones) . The contemporary and complex design of the building is more than matched by the considered integration of natural light, open space, and diverse plant life in the project’s landscape architecture. 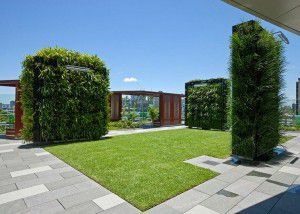 The sloped Greenroof and the Greenwalls are constructed using 1630 Elmich VGM Greenwall modules. The 250mm deep modules ensured that a deep growing media layer would be well contained on the slope. The paving is supported using 11,000 VersiJack Adjustable pedestals, the pedestals and paving are separated from the turf areas by low block work walls, the adjustable pedestals ensure the pavers sit flush with the turf eliminating the need for a thicker heavy slab or bedding sand. 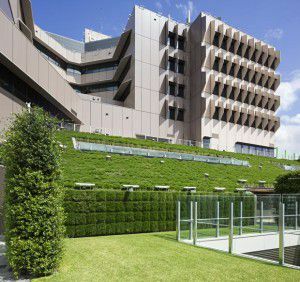 Research has shown that plant life supports health and well-being, the addition of this densely planted greenroof provides much needed tranquil outdoor space and is over looked by much of the patient accommodation. The roof landscape also functions as acoustic insulation helping to manage the ambient noise of the busy roads, keeping the internal spaces as peaceful as possible.